The Vietnam Maritime Administration has asked provincial port authorities to inform ship owners and management companies of acts of piracy in the waters off east Sabah, Malaysia, and southern Philippines. The request was made after the administration received a special report from the Regional Cooperation Agreement on Combating Piracy and Armed Robbery against Ships in Asia (ReCAAP). The administration asked the ship owners and companies that manage and exploit vessels to adopt a maritime security plan approved by the Vietnam Register, paying particular attention to the ReCAAP’s recommendations to ensure that no problems befall Vietnamese ships working in international waters, especially in the two danger zones in Malaysia and the Philippines. Previously, between March 26 and April 15, a source at ReCAAP in the Philippines spoke of three cases related to seamen being kidnapped in the waters off east Sabah in Malaysia and southern Philippines. The cases involved the Brahma 12 ship on March 26, the Massive 6 ship on April 1 and the Henry ship on April 15. On March 26, the Malaysian Brahma 12, transporting 7,000 tonnes of coal, was attacked by 17 pirates with guns, travelling on a high-speed ship. They kidnapped all 10 crewmembers and demanded a ransom of US$1.07 million. On April 1, the Malaysian Massive 6, with nine seamen onboard, were attacked by eight pirates with guns. Four of the crewmembers were kidnapped. On April 15, the Indonesian Henry was attacked by a band of pirates. 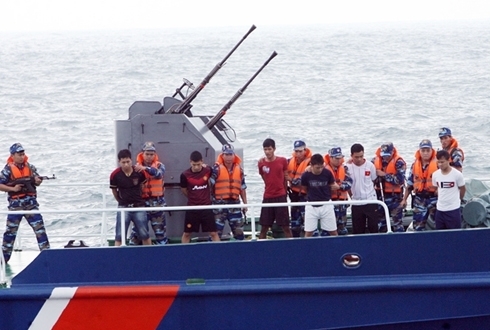 One of the seamen was injured, while four others were kidnapped. To prevent similar cases, the Malaysian government has temporarily banned travelling on the trade route between east Sabah and the southern Philippines. The concerned organisations from the two countries will meet to discuss preventive measures for the problem. The ReCAAP encouraged the authorities of coastal countries to improve supervision and tighten patrols. Ship owners and management companies should be vigilant while working in these areas. The Philippines’ coastal protection organisation has joined hands with the country’s local intelligence agency to collect more information on the case and to provide updates on the condition of the kidnapped seamen.